Or for Hanukkah. Or for Yule. Or just because. Because friends don’t let friends get bad tattoos! Alas, he put his faith in the internet and the results were, shall we say, less than optimal. I really wish this were a fairy tale! The video above may be an advertisement (in fact, it’s a promotional video by my publisher, Bradan Press, filmed in a real tattoo studio and at a Nova Scotia kitchen party) but the situation it portrays is all too real. There is a significant interest in tattoos, engravings, cards, and other such things in the languages of the Celtic lands. In the nearly 15 years that I’ve been learning Irish, I’ve seen literally thousands of requests for tattoo translations, and almost as many requests for translations for artwork, cards, T-shirts, etc. And that’s just in Irish. Heaven knows how may translation requests go out every day for Scottish Gaelic, Welsh, Cornish, or Breton. What’s really frightening, though, is that for every person who has requested a translation, whether from a forum, from a professional translator, or from an individual, there are many more who just do an internet search, or make the mistake of relying on Google “Translate.” And many of those translations, though hideously bad, end up permanently inked on someone’s skin. (Not to mention in my blog. Here are just a few tattoo travesties I’ve written about in recent years: It’s A Long Life With A Bad Tattoo, The Great Soulmate Debate, Big Sister’s Big Mistake: Four Mistakes in Two Words). 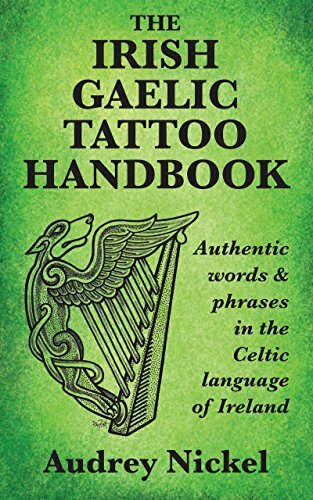 Two years ago I was approached by Celtic-themed Canadian publisher Bradan Press about writing The Irish Gaelic Tattoo Handbook as a companion to The Scottish Gaelic Tattoo Handbook, which had been published the previous year. It was exciting, working with friends who are native speakers, as well as two professional Irish-language editors, to come up with the best, most authentic, translations for the most commonly requested tattoo words and phrases. It was even more exciting to have the opportunity to educate people a bit about the language and about the translation process, which is much less simple than you might imagine! Sometimes I look at the book, open it and read the first chapters, and hope that it’s encouraged people to learn more about this language that I love. Although both books target tattoo seekers, both are also valuable for people who use, or would like to use, these languages in their artwork, as well as for such things as family reunion T-shirts, grave markers, and other such purposes (Fun Fact: After tattoos, inscriptions for grave markers/tombstones are the most commonly sought after Irish translations!). Beyond these, both books are great for people who have an interest in or are learning these languages, as they supply not only common phrases, but also basic facts about the languages and the people who speak them (yes, both are living languages). If you have friends or family members who are interested in the Celtic languages, or in tattoos, or in both, these books make great stocking stuffers! But seriously…don’t delay. Both books will increase in price in 2019, so if you want them, or know someone who would like to (or should) have them, now’s the time to buy! And There’s More! Here’s to a Happy New Year! I did mention that this is a series, right? Well, it takes more than two to make a series, and I’m happy to announce that the next two books in the series will be available in spring, 2019! The Welsh Tattoo Handbook is one of the books that will be coming out next year. Welsh, a Celtic language that is spoken in Wales and in parts of Argentina, is a member of a different branch of the Celtic language family: The Brythonic Branch. The Scots Tattoo Handbook is the first of the series to address a language that is spoken in a Celtic country, but is not itself a Celtic language. Scots is a Germanic language spoken in the Scottish lowlands and in Northern Ireland (If you’ve ever sung “Auld Lang Syne,” or read any poem by Robert Burns, you’re familiar with it). While some may argue whether Scots is a language distinct from English or a dialect of English, it is distinctive enough to merit its own book, and should interest anyone who has a love for Scotland! Nollaig Mhaith, agus Athbhliain Faoi Mhaise Daoibh! Previous Previous post: Clannad (Not the Anime) Abú! Next Next post: Oh, What an Idiom!